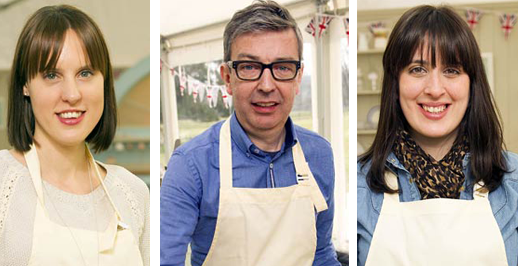 So the Great British Bake Off series 4 started on Tuesday! I have been pretty excited and a little apprehensive about this series. I absolutely love the Bake Off, Series two is part of the reason I started baking and blogging more often. Series 3 was a bit of a disappointment. I didn't warm to many of the contestants, the bakes were uninspiring and it all started to feel a bit cynical to me. After one episode I have high hopes that its going to be a good series, I already have a few favourites. Frances, Howard and Beca all showed their creative flair in the first episode and I am excited to see how they get on over the whole series. Rob and Lucy were also good but they weren't really prominent in the first episode. Who have been your favourites so far? Have you picked your winner already? This year I have decided to bake-a-long with the series, I am going to try to bake one thing inspired by the show each week. There will be a weekly linky over on Bakers Anonymous if you fancy joining in too. I baked this cake before watching the show so found myself falling into some of the same traps the contestants did in terms of greasing the tin. Although, even with its wobbly shape and slightly dipped top it is bloody delicious! The floaty, light texture is simply heavenly. I think I may have found my perfect cake! I followed Ruth at The Pink Whisk's recipe and it was really easy to follow. I opted to make mine lightly lemon in flavour (mainly because I ran out of vanilla!). I started by measuring out the flour and sugar and sifting both (separately) 4 times. You want the finest powder possible.Add 40g of the caster sugar to the flour and sift together one final time. (it is worth the hassle, honest)Pop the egg whites and cream of tartar into your stand mixer (or a large bowl if your using an handheld) and beat until very stiff.Add the remaining 210g of caster sugar to the egg whites gradually, beating well between each addition.Then gently fold in the flour (and lemon zest) making sure it is totally incorporated. Try to be gentle, you don't want to knock all the air out of those egg whites.Gently put the mixture into a NON-GREASED tin and bake at 170C for 40 minutes. Once cooked, invert the tin onto a cooling rack and leave to stand until cool. Gravity should do its thing here and leave you will a nice tall angel cake! I used a funnel/angel food pan which I bought from Amazon here. Although, Steph from Riverside Baking used a bundt tin and was successful. I was expecting this bake to be a bit faffy but I was pleasantly surprised by how easy it was, I will definitely be making it again in the future. I may need to find a use for 9 egg yolks though as it seems a bit wasteful. Anyone for custard? I've always wanted to attempt angel food cake but it's always been the most daunting cake to me! I thought the same to be honest, but having made it, it is really simple! I loved the first episode! I definitely think the woman the created the squirrel cake is one to watch - she had some amazing ideas! Yes Frances is one to watch for sure! I'm definitely warming to the characters far more in this series than last series. I don't know how so many people managed to cut themselves though in the first episode! Your angel cake looks lovely and fluffy. I haven't been brave enough to try one yet. Your cake looks beautiful, very soft, light and fluffy. I ended up using store bought egg whites in a carton but you could use the extra egg yolks to make ice cream! I did think about buying just egg whites, but it is so much more expensive! Great idea with the ice cream though.